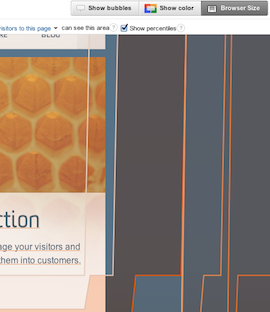 It seems like every time I login to Google Analytics these days, something has changed. Google is really following the “iterative” in Iterative Development lately. Some of these changes are major, and get full-on blog posts, and others Google seems to just sneak into GA in the middle of the night. Here’s the ones I could find, comment below if I’ve missed anything. Website Optimizer is dead, Content Experiments are the new A/B Testing. We covered this in a lot of detail in that linked post, but it’s worth reiterating what a big change this is, and I’ve already noticed much of the web using these (you see the telltale utm_expid query parameter). Mobile App Analytics introduced – This is still in beta, but it’s great to see Mobile Analytics finally broken out from the model of web analytics, as we’ve found they need to be measured in completely different ways. Entrances – “Entrances is the number of times visitors entered your site through a specified page or set of pages.“, basically this tells you the same thing you could have seen in the Landing Pages report, but gives a little more context around the Bounce Rate and % Exit numbers when seen in the other content reports. Custom Variable Metric Name Changes – While nothing has functionally changed here (to my knowledge), the metric description has been “clarified” (I’d argue it’s more confusing now) to be called “Visit Starts”, “Avg Visit Duration per Start”, etc… This is to better reflect the behavior that occurs when you set a custom variable at the Page level. I’d love to actually see the scope of the variable in Google Analytics, instead of these name changes. 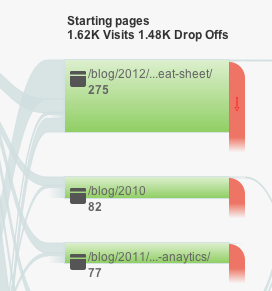 Flows UI – All of the “Flow” reports have an improved UI that makes everything a little clearer. This is pretty minor but hopefully clears up some of the confusion people have had over these reports. Chances are Google will add a few more since I wrote this blog post, that’s how quickly things are changing these days. It’s great to see the product get so much love from Google, and I’m excited about what is around the corner.